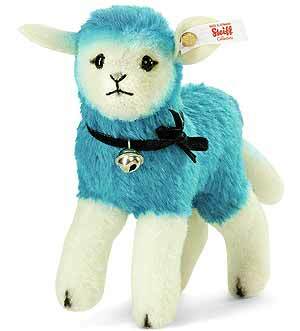 Candy Lamb by Steiff. From the designers choice series, this beautiful hand made piece, in turqoise and white mohair, is non jointed and wears the white ear tag, signifying this item as a Steiff limited edition, together with the famous gold plated Button in Ear. Limited edition of only 1000 pieces worldwide. Product details: safety eyes, synthetic filling material, non growler, size 14cm. Comes boxed, together with a numbered certificate of authenticity. Candy is part of the new series "Designer´s Choice". The idea: our designers create new classics, by freely changing life-like animals, whilst remaining faithful to our traditional standards. Candy is made out of high-quality turquoise coloured Mohair and white pure wool plush and really enjoys life! In the Chinese Year of the sheep is a wonderful symbol for bringing us closer to love, compassion, caring and all other aspects of humanity. And let´s remember to make a contribution ourselves... Let yourself be inspired by our peace-loving, joyful Candy lamb. It will be released in a limited edition of 1,000 pieces, wearing a gold-plated "Button in Ear" and a black velvet ribbon with bells. Candy loves to spend her days together with Pinky - the pretty sheep from the same series.